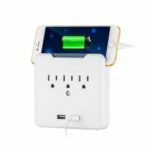 Protect your electronic equipment from damaging voltage and current spikes with this wall-mount power outlet. 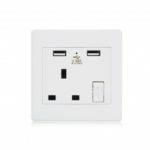 It has 3 protected power outlet for US plug, two USB charging outlets. 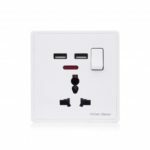 The USB ports provide dedicated 2.1A charging and can be used to recharge smartphones, tablets and other USB mobile devices. 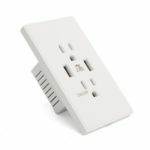 Designed with triple 3-prong AC outlet for US plug and two USB charging outlets. Two USB charging ports produce a total of 2.1A of charging power. Provides up to 900 Joules of power protection. Comes with a dock for storing your mobile phones, tablets and etc while charging.